Measures Ambient Temperature in the range of -30°C to +80° C with a typical error of ±0.75°C in the 0°C to 80°C range. 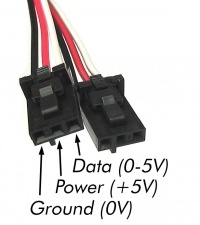 The temperature sensor component is rated at -40°C to +100°C, but the other components on the board, the connector and the cable are rated at -30°C to +80°C. 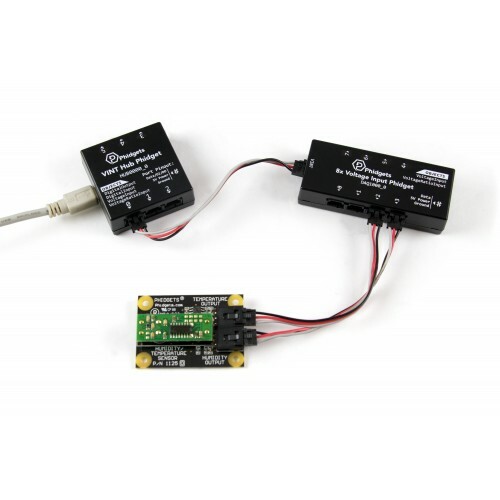 In a fast prototyping environment the temperature sensor board can be pushed to the ratings of the sensor component, but you should use the lower temperature ratings if you plan to use the 1125 in a commercial application. 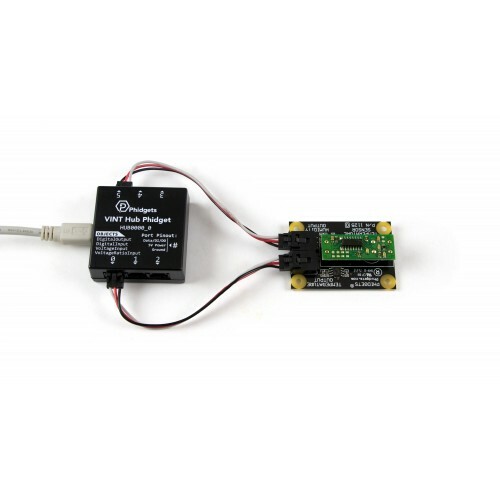 This sensor is intended for use in non-condensing environments. Allowing the sensor to come in direct contact with water vapor or condensation could damage the circuitry. 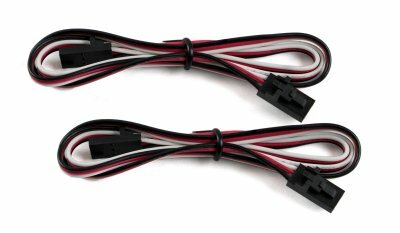 Any Phidget with a Analog Input or VINT port, here are some compatible products. We will be using the HUB0000 for this guide. Connect the 1125 temperature output to the HUB0000 using one of the Phidget cables. 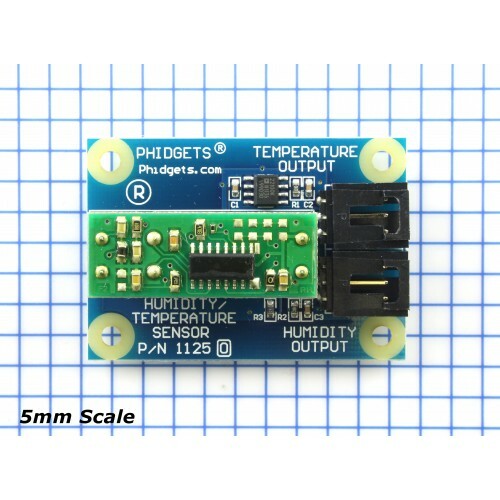 Connect the 1125 humidity output to the HUB0000 using the second Phidget cable. Now that you have everything together, let's start using the 1125! 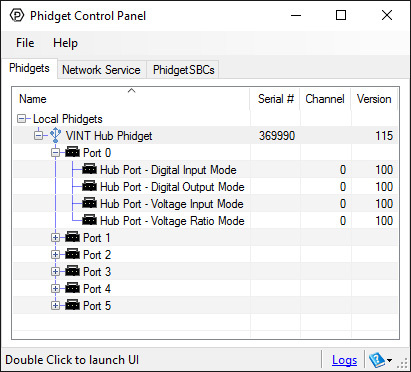 In order to demonstrate the functionality of the 1125, we will connect it to the HUB0000, and then run an example using the Phidget Control Panel on a Windows machine. Linux users can follow the getting started with Linux guide and continue reading here for more information about the 1125. Select the 1125 from the Sensor Type drop-down menu. The example will now convert the voltage into temperature (°C) and humidity (% RH) automatically. 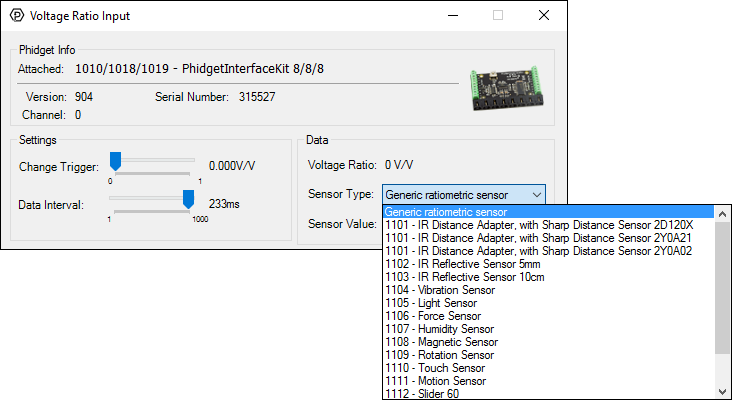 Converting the voltage to temperature (°C) and humidity (% RH) is not specific to this example, it is handled by the Phidget libraries, with functions you have access to when you begin developing! 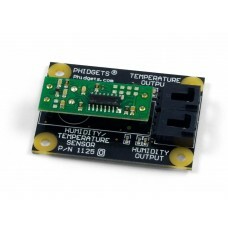 This sensor produces an analog signal between 0-5V depending on the input temperature or humidity. This signal is measured by the Phidget it is plugged into, such as the HUB0000 or the 1018, and interpreted by the Phidget library. You will need to reference the User Guide and API for that Phidget for more information on how to use this type of device in your program. For more information about the signal produced by this device, check out the Voltage Ratio Input Primer. 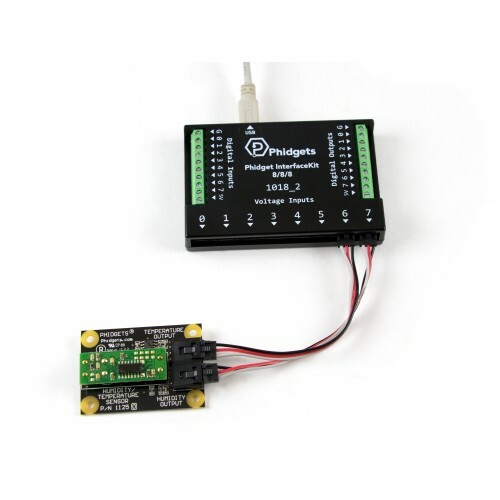 When used with a Phidget that measures the signal from this sensor, this Phidget is compatible with our VoltageRatioInput Examples. They outline the use of the VoltageRatioInput API, which is used to interpret the signal from this device. Once you have your example, you will need to follow the instructions on the page for your programming language to get it running. To find these instructions, select your programming language from the Software Overview page. The 1125 is a precision temperature to voltage converter that outputs a voltage that is directly proportional to temperature. 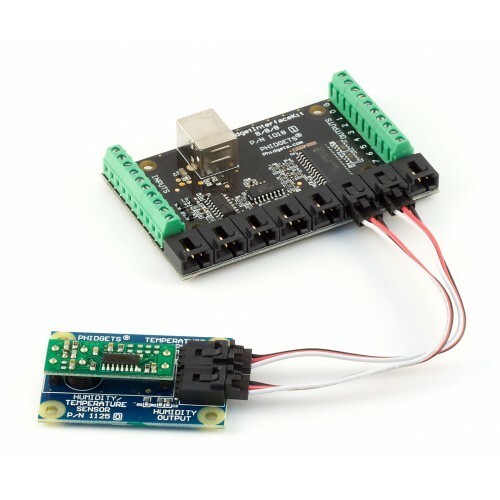 The temperature sensor component is rated at -40°C to +100°C, but the other components on the board, the connector and the cable are rated at -30°C to +80°C. In a fast prototyping environment the 1125 can be pushed to the ratings of the sensor component, but you should use the lower temperature ratings if you plan to use the 1125 in a commercial application. The 1125 measures the relative humidity of the environment around the sensor. Built in temperature compensation produces a linear output ranging from 10% to 95% relative humidity. Values outside of this range may be usable but will have increased error.